Those of you who have watched or read Nick Hornby’s High Fidelity, will be familiar with the idea of top fives. In the movie, the main character (played by John Cusack) is a record shop owner, who spends most of the movie revisiting the demise of his past relationships, and in so doing, constantly re-imagines his top five break-up songs according to how each break-up made him feel. However, top fives are not limited to songs or relationships, you can have a top five anything: top five smells, top five colors, top five sneaker brands, top five breakfast foods, etc., anything at all. There are only two rules to top fives: one, everyone’s top fives are different, i.e. there is no single right or wrong top five; and two, your own top five selection will almost certainly change over time, as Cusack’s did according to the particular break-up. 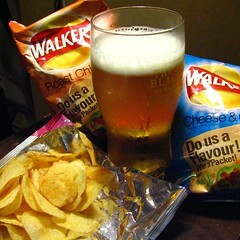 One top five that I spent much of my early twenties thinking about is my top five crisps, or potato chips. Much of this thinking was done in the pub because a) much of my social life was in the pub, and b) after a number of pints, one often finds oneself craving salty snacks. This craving led to the purchase of far too many bags of crisps in a variety of halitosis-inducing flavors, followed by lengthy arguments about their various merits. The purists, and I happen to agree, would argue that you shouldn’t compare potato crisps with cheese puffs because the latter are made from corn. It would be like comparing dogs to cats. So rather than do a top five salty, packaged snack foods that are good with beer, this is simply a top-five potato crisp/chip flavors. Of course, this begs the question what my top five salty, packaged snack foods are, or if a better top five would be my top five cheesy corn snacks, but that would be another post, or number of other posts. without lines of reasoning, because yours won’t be the same as mine, and my top five might even change if you suggest a flavor I’ve left out. 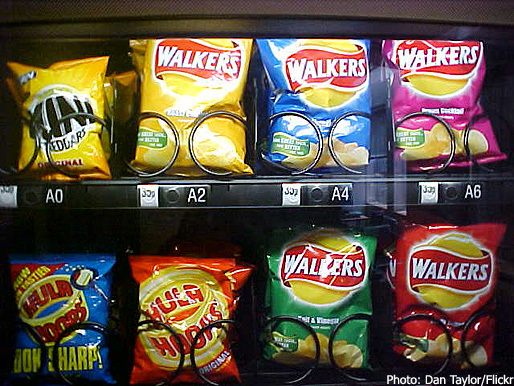 It’s all very subjective, and, some may say, pointless, but I love top fives because they are a source of endless and purile debate, which in election season might just be the antidote you need.The “best” top five (selected according to how I’m feeling at the time) will win a flavor-selection of fine English crisps. 1. Of course, the king, beating out every other flavor by a country mile, salt n’vinegar. What can I say? It’s just magnificent. The perfect combination of salt and acid with the fried potato taste of the crisp. Cuts the beery mouth feel and encourages salivation, then requires more beer to refresh the slightly parched tongue, and when you get to the bottom corners of the bag where all the flavor and crumbs reside, the vinegar’ll turn your lips purple. Glancing around the pub, you tell you’re not alone as you spot other sn’v lovers by shade of their lips. I think a cultural food study could be done on the varying food tastes from country to country, based on popular chip flavours. Here in Canada, sour cream & onion and bacon & cheese are popular, in Greece there’s sea salt and oregano and feta with tomato. I wish I saw more exotic flavors around here. Oh yeah, I remember seeing “fancy” potato chip flavors in London! Just an aside: there is SERIOUSLY no good chips here anymore. Definitely, Barbecued Flavor Chips are the only ones on my list. I’ve recently found your blog and I love it. I’ve given you an award. Check it out. Congratulations! Trying to remember/look up the names of some of the delicious snacks in Japan sent me down a rabbithole of hilarious Japanese snack food advert videos. So much funneh! hhhmmmmm this is a tricky one. 1. Charley’s chips in the tin – no flavor – impossible to find. You have the best flavors in England! And the strangest compared to here, but they sound good to me! 5. Sour Cream & Onion: kind of a bad reminder of childhood junk food fests but still pretty tasty in small quantities. 4. Crab: Hey, I grew up on MD crabs so a little crab ‘n’ Old Bay flavoring is a good thing. 3. Mushroom: These may not be readily available, but Herr’s makes them in tribute to southern Chester County, PA — mushroom capital of the US. 2. Plain: Yes, plain. Sometimes no extra flavoring is the way to go. 1. Salt & Vinegar: I’m with you guys. Nothing’s better with a pint of best bitters. I have recently found this brand called DIRTY POTATO CHIPS from Louisiana, they are sold all over NYC and NJ. They are BEST chips I have ever tasted. I really don’t want to try a 5th flavor. I am too frightened. These are so damn good!!!!! 1. Salt and vinegar (Squares and/or Discos. Oh, and McCoy’s crinkle cut). 2. Nice ‘n’ spicy nik naks – for the nostalgia factor! 3. Cheese and onion. Classic. 4. Prawn cocktail – tangtastic. 5. Pickled onion. Preferably monster munch. Afterthought – scampi fries – but not good in a social situation. TNSmackdown – i don’t know if i have 5…sour cream and onion, bbq, sour cream and cheddar…the end. sulineats – Jalapeno, dill,… ok, that’s all I can come up with so far. My last 3 are heavily influenced by the fact that I just moved back to the US from Japan and am missing Japanese junk food. Sigh. I wish we had some more exciting flavours in London. 1.) Ready Salted Hula Hoops. Hope you don’t mind I added extra info, just in case anyone wants to compare. Jeez this is hard. I’m a potato chip junky, and working in a British pub also taught me the joy of chippies – crisp sandwiches on buttered white bread, sometimes dipped in curry sauce. It’s a heart attack waiting to happen, but oh god so tasty. OK, jalapeno, dill, salt and vinegar, that calbee hot and spicy one, and uh…. Old Dutch plain (ripple) – with dip. Our favourite crisps are produced by a Spanish firm called FRIT RAVICH ……. we’ve only been able to buy them on the Catalane border between France and Spain …. Le Perthus and La Jonquera …. there made I think of potato starch and maize altho’ I’m not sure ….. there was a similar product made in the UK in the late 80’s early 90’s called Wheelze …. ‘cos that what they looked like ….. Paprika … Plain and my favourite S&V …… the bags of ‘wheels’ from Cataluna come in large bags of 325 gms at about 2 euros….. does anyone know if the are available in the UK ? happy munching !! My favorie chips change as often as my mood but a few standbys. As you can tell I like a chip to be salty, with a bit of sour and a pinch of sweet n spicy… that’s the whole package.